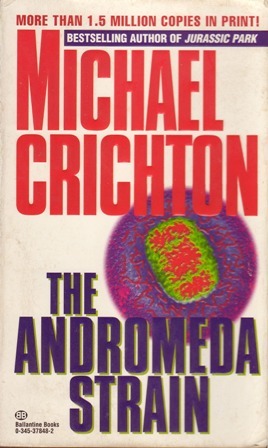 Recently I reread Michael Crichton’s The Andromeda Strain. I first read it not too long after it came out in 1969 (at least the paperback), which would have put me in high school or college. I kind of think high school because 1) I had no time to read any novels during the 4 years I was in college and 2) I remember not really having much of an idea what was going on in it. As a result I did not read Crichton again until Jurassic Park came along in 1990. I had no problems understanding what was going on in Jurassic Park, in fact, I loved it and went on to read almost all of Crichton’s novels until his death. Now I’m going back to catch up on his early work. Re-reading The Andromeda Strain I certainly understood why I might not have grasped what was going on the first time, since it’s heavy on the science/medical stuff which I had no frame of reference for in high school. This time I had no problem with any of it, because almost all of it was familiar. The funny part was how outdated it was combined with the pervading tone of “Wow! isn’t this new computer technology mind-blowing? !” Now days all that stuff is clunky and slow, and the “weird” new technologies are commonplace. What was even more interesting to me, and what I now see runs through almost all his work, is the idea that science is fallible and subject to the effects of ignorance, stupidity, naivite, arrogance and thus — my conclusion here — not to be worshipped. “This book recounts the 5-day history of a major American scientific crisis. As in most crises, the events surrounding the Andromeda Strain were a compound of foresight and foolishness, innocence and brilliance. Nearly everyone involved had moments of great brilliance and moments of unaccountable stupidity. To the list he adds fatigue, minor but not uncommon malfunctions of machinery, and incorrect but logical assumptions born out of pre-existing mindsets that affected the investigator’s perspective and direction of inquiry. All these combined in the story to hinder and dangerously delay their arrival at the truth of what the Andromeda strain was and what it did. “Biology… was a unique science because it could not define its subject matter. Nobody had a definition for life. Nobody knew what it was, really. The old definitions — an organism that showed ingestion, excretion, metabolism, reproduction and so on — were worthless. One could always find exceptions. One of the characters then presented three objects as rebuttal to this definition: a black cloth that absorbs heat, a watch with a radium dial, and a piece of granite which he challenged the other team members to prove were not living. The cloth absorbed heat, seemingly to no purpose, but how can we say that for sure? The watch showed decay in process, and the production of light, but again how could it be said for sure there was no purpose in it? Finally the granite, which he claimed was living, breathing and walking, only at such an infinitesimally slow rate we can’t see it. To the granite we are like flashes in the light. I loved this. Made me think of God, though of course He does see us, and has revealed Himself to us. He has not left us at the mercy of our limitations of sensation and rationalization, only of our volition. That it was possible they might not be able to analyze certain life forms should they arrive…might not be able to make the slightest headway, the least beginning in such an analysis. I loved this for the elemental humility that is in it, for showing the limits of science and man and drawing parallels (though not explicitly) to God, who is not only an “alien” life form, but the source of life. And we cannot analyze Him, not in full, even with His word. Delving into questions like these should make us sit back and realize that. As a culture and a civilization, we’ve spent so much time and energy and man-hours of effort trying to analyze our world, trying to figure out how the Lego pieces fit together, as it were. We’ve “invented” and produced a lot of things that supposedly make life easier and safer and healthier and cleaner. But… I do not believe we are any happier than any other generation of people. Because the only one who’s really worth all that time and effort to understand is God who is the only source of true happiness. This entry was posted in Book Thoughts and tagged Books, Science, science fiction on September 12, 2010 by Karen Hancock. You say it so well! I see nations like France being overrun with a Muslim population that seeks ever more power. I see the most extreme laws of Islam taking over countries and making martyrs of Christians and Jews, and I wonder how long our leaders are going to kowtow to those who hide behind our flag while plotting the same fate for America. I agree with you, though, that the best way to counteract these trends is to make our homes the cradles of Christian civilization. I’ve linked to your website from my page and honored to do so.